The pound sure knows how to drop it like it’s hot! A quick glance at the charts would reveal that the British currency slipped by more than 7% against the U.S. dollar this year as it tumbled from the 1.6300 area in January to the 1.5100 region last week. Against the yen, the pound is down by nearly 600 pips this month as it traded close to 148.00 then crashed to 142.00. 1. Moody’s downgraded U.K. debt recently. Just before the New York session closing bell capped off the trading week last Friday, Moody’s caused a ruckus in the markets as it stripped the U.K. of its triple-A debt standing. The credit rating agency downgraded U.K. debt to just AA1, citing the bleak economic outlook as its main reason. According to the statement from Moody’s, the BOE‘s current efforts to stimulate the economy still doesn’t seem to be enough to ensure sustainable economic growth. Ongoing austerity measures remain a huge constraint to the economy and U.K. Chancellor Osborne has less than a month to squeeze the government budget to meet the targets for March. Otherwise, credit rating agencies such as S&P and Fitch could echo Moody’s downgrade. 2. Cable just broke below 1.5300. 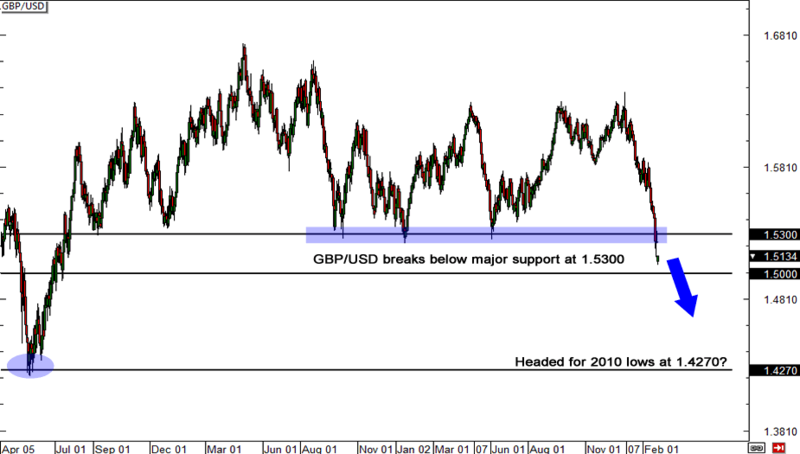 Technically speaking, GBP/USD has now broken below major support at the 1.5300 handle, which has pretty much held for the past 2 ½ years. Looking ahead, I don’t see any support levels until the 1.5000 psychological figure but, if that doesn’t hold, we may just see it drop all the way down to the 2010 low at around 1.4270. 3. BOE Governor took a dovish stance. The latest MPC meeting minutes showed that incumbent BOE Governor Mervyn King voted with the minority, as he was one of the board members in favor of more quantitative easing measures. A quick look back in time will show that over the past six years, of the three times that King voted with the minority, twice we saw monetary policy changed in favor of the minority’s stance within three months. Talk about having influence in the central bank! I wouldn’t be surprised if it happens again, as recent retail sales figures support the theory that the U.K. recovery is losing steam. One way to buck the trend would be for the BOE to ratchet up its bond purchases in order to give the economy a boost. Of course, if the central bank does decide to finance its debt by printing more pounds, it would be bearish for the pound. Do you think the pound will continue to drop in the coming months? Let us know what you think by voting through the poll below! Do you think the pound will continue to drop in the coming months?